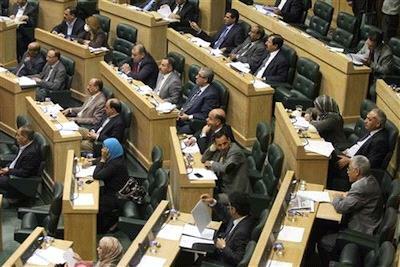 AMMONNEWS - The Lower House of Parliament voted unanimously on Wednesday to ask the government to expel the Israeli Ambassador in Amman, and recall Jordan's ambassador in Tel Aviv in objection of Israeli attacks in occupied Jerusalem. The vote comes after deliberations Wednesday morning over the latest wave of Israeli violations in in Jerusalem and the Palestinian territories. Members of Parliament denounced the continued storming of Jewish settlers into Al-Aqsa Mosque. The occupation forces prevented citizens from both genders who are under the age of 50 years from entering the Mosque, yet allowed Jewish settlers to break into Al-Aqsa Mosque in occupied Jerusalem on Tuesday, in the occasion of the 46th anniversary of the so called "the reunification of Jerusalem" under the protection of Israeli soldiers and policemen and toured the place. Prime Minister Abdullah Ensour described the ongoing and escalating attacks on Al-Aqsa Mosque by Israeli forces and settlers as "premeditated and foretells of evil intentions." Ensour said that the cabinet addressed the Israeli actions in a meeting Wednesday morning, and agreed to direct Jordan's Ambassador in Tel Aviv Walid Obeidat to file an official objection to the Israeli government "as a first measure," followed by resorting to the UN Security Council if matters escalate. MPs however went further to demand recalling Jordan's ambassador back to Amman and expelling the Israeli ambassador here, voting unanimously on the matter to be formally proposed to the government by the Arab and International Affairs House committee. Over 25 MPs signed a petition to reconsider the 1994 Wadi Araba Peace Treaty between Jordan and Israel, citing the cause to be the continued Israeli violations in Palestine and voicing Jordan's denunciation. In their speeches, MPs demanded a "strong response" from the Jordanian government, and called for limiting Israeli air force's use of Jordanian airspace, particularly in light of the recent Israeli airstrike attacks on Damascus.